The situation regarding Sussex is somewhat different: there is very little evidence for 5th-century Saxon occupation in West Sussex other than the cemeteries on Highdown Hill and Apple Down, Compton north of Chichester: the latter may have started being used as late as 500 and has possible evidence for both British and Jutish burials (Down and Welch 1990). The Saxon cemetery on Highdown Hill is of particular interest in that one of the graves yielded a glass vase of 4th to early 5th century date engraved with the inscription 'Use Me and Good Health to You in Greek and thought to have been made in Alexandria (Harden 1959). A short distance to the north of Highdown Hill is the village of Patching, where the latest Roman coin hoard from Britain was discovered in 1997 (Abdy 2006). It includes 47 gold and silver coins, of which 13 of the solidi are orthodox issues of the emperors Gratian to Valentinian III (AD 380-450+) and ten pseudo-imperial Visigothic issues in the names of Valentinian III, Majorian and Libius Severus (AD 440+-461+). The Notitia Dignitatum records the Ala Prima Saxonum serving at Verofabula in the Levant under the Duke of Phoenicia (Bartholemew 1984, 169) and it may be that one of the veterans of that unit settled in the Patching area during the early 5th century, bringing with him an Egyptian glass vessel acquired on active service. The coin hoard could have originated as the pay of another Saxon veteran serving in the 5th century Visigothic or Roman army. It is interesting to note that another pseudo-imperial gold solidus of Valentinian III (AD 439-55) came from the suburb of St Pancras outside the walls of Chichester (Abdy and Williams 2006), in an area that has produced some of the latest Roman pottery from the city. Well 2 at the Needlemakers site in St Pancras yielded 18 coins ranging in date between the late 3rd century and c. 364-78 and a high percentage of finewares (Down 1981). These include fragments from at least 18 late 4th-century bowls and dishes in Oxfordshire Red Colour-coat fabric (OXRS) and two from a Pevensey ware bowl of similar date (Lyne 1994, 181-2). This last-mentioned industry had its origin during the late 4th century, producing copies of Oxfordshire Red Colour-coat (OXRS) forms at the Pevensey shore fort for the garrison there and for the rural population of East Sussex (Fulford 1973). A few bowls and dishes in this high-fired fabric went further afield, including to Ickham in East Kent, where fragments of one bowl came from a timber-lined pit in association with very late Roman wares and a fragment of Early Anglo-Saxon pottery (Lyne 2010, 109). 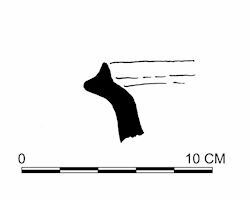 Small quantities of Pevensey ware were also found within the fort at Portchester, and always in the very latest Roman occupation levels (Fulford 1975). The excavator thought that the well at the Needlemakers site was back-filled between 395 and 425, before the establishment of an inhumation cemetery on the site. Most of the 14 burials lacked grave goods but the disturbed Burial 10 had two indented New Forest Colour-coat beakers at its head and Burial 9 had a small hoard of 57 coins above and below its feet, comprising one of Claudius II, eight of the Tetrici, 46 illegible radiates and a Gloria Exercitus issue of the House of Constantine (Down 1981, 91). Coin hoards as grave goods are very unusual, but paralleled in the late cemetery at Frilford, Berkshire, where 34 coins ranging from Valerian to 395-402/3 were placed over and behind the skull of an inhumation thought to be early 5th century in date (Bradford and Goodchild 1939). A short distance south of the Needlemakers site, at the Chichester Cattlemarket extra-mural site, a well was constructed after 341-6 in association with three timber-framed buildings (Down 1989, 72). The latest coin from the bottom of the well was dated 375-8 but re-examination of the large pottery assemblage from the back-fill of the feature suggests that it went out of use at a somewhat later date (Lyne 1994, 183-4). The coarse pottery in the assemblage is mainly pre-270 in date and derived from a midden in the vicinity but the bulk of the fine pottery is late 4th century and includes Argonne ware. Late coarsewares are largely restricted to four small handmade vessels, including two dishes and a jar in very coarse fabric with grog, black ironstone and calcite filler. The fourth vessel is a rather wobbly handmade straight-sided dish, only 100mm in diameter, in Alice Holt greyware with internal white slip. This must be one of the last products of that industry and is similar to other unpublished examples associated with stamped Early Saxon wares from the unpublished enigmatic ?ritual site at Eden Street, Kingston on Thames (Lyne 1994, 219). There is little doubt that occupation continued at Chichester into the mid-5th century but may have become largely extra-mural, with the walled city becoming a place of refuge when danger threatened. Any study of the 5th century in East Sussex must inevitably centre on what was going on at the Pevensey shore-fort. The inhabitants of that fort appear to have had wide-ranging trade-links during the 5th century (Lyne 2009). 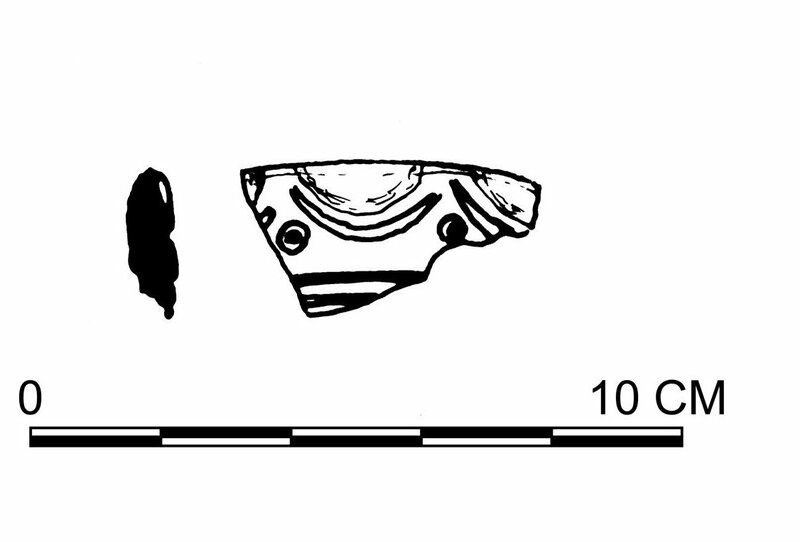 There are a couple of Palaeochristian grey and red ware vessels from southern Gaul (Figures 4 and 5), one piece of which is from a bowl of Rigoir's form 15A (1968) decorated with his type 880 stamps, and a fragment from a Macedonian greyware bowl of Anderson-Stojanovic's Form 2 (1992 and see Figure 6). 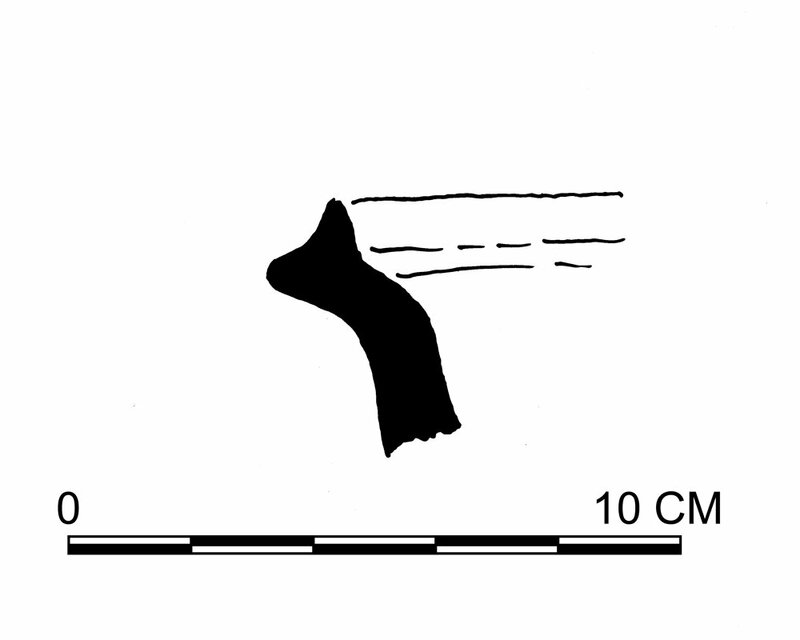 Fulford's excavation in 1994 yielded fragments from at least three North African red (NARS) slipped ware vessels (Timby 2011). These comprise a dish of Hayes form 75 (1972, c. 400-475), a bowl of his form 91 (c. 400-475) and a bowl of form 99C (c. 575-650). 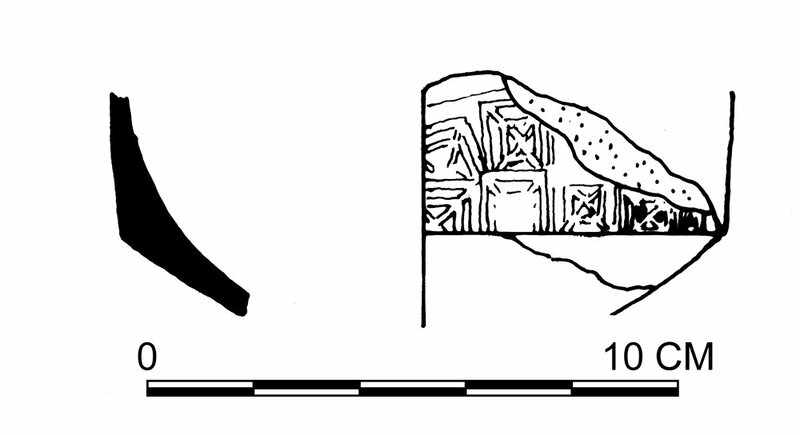 The local sub-Roman pottery consists of small handmade and poorly finished black pots with a mixture of coarse alluvial sand and clay grog filler (Figs 7 to 9): similar wares also occur at Frost Down and Friston on the most easterly block of downland between the Cuckmere and Beachy Head (Lyne 1994, Industry 5E). 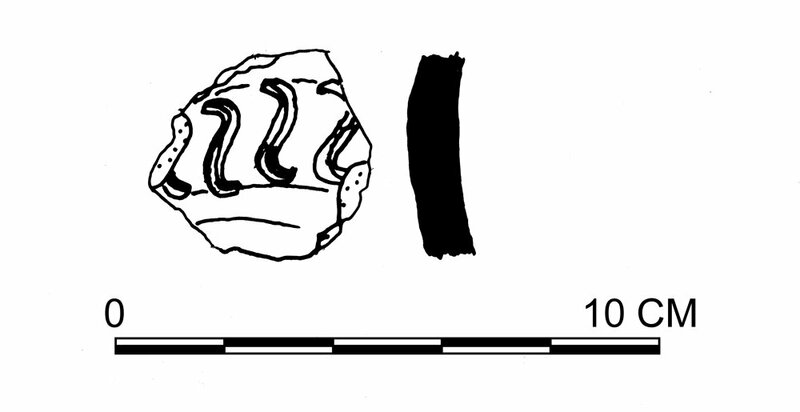 One of the jar fragments from Frost Down was decorated with wyrm stamps similar to those found on Early Saxon pots of late 5th to 6th century date, which suggests that the sub-Roman inhabitants of Pevensey included a Germanic element before the sack of the fortress during the late 5th century (Figure 10). Where might this postulated earlier Germanic element within the British population of East Sussex have come from and when did they arrive? Excavations at Beddingham near Lewes and Burgess Hill suggest that Saxon settlement in East Sussex may have commenced earlier than previously thought. The Roman villa at Beddingham was abandoned during the mid-4th century but a small apsidal-ended stone shrine or church in the field immediately to the north was converted into a dwelling at some time after 370. Occupation within the apsidal west end of this structure yielded a mixture of Early Saxon pottery and fresh Roman sherds of late 4th century or later date. 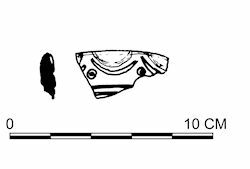 The Saxon sherds include fresh fragments from two standfussgefass pedestalled vessels of types thought to be earlier than 450, and the Roman fragments include those from a Pevensey Ware bowl datable to after the abandonment of the villa (Lyne forthcoming b). Excavation of a ditch at Burgess Hill in the Weald yielded a large very late Roman pottery assemblage with quantities of crude, handmade grit- and grog-tempered ware, horizontally rilled jars in Overwey/Portchester D (PORD) fabric, Alice Holt greywares and Oxfordshire Red Colour-coat (OXRS) finewares (Lyne 1999b). In among all this fresh Roman material was an equally fresh rounded base from an Early Anglo-Saxon cooking-pot, suggesting that both types of pottery were in contemporary use. There are at least two ways of interpreting this evidence. The first interpretation is that some Saxons were settled in East Sussex during the period 370-410, perhaps mercenaries hired to man the fort at Pevensey, and were granted lands in the vicinity. The second interpretation supports the idea of pottery production in the Romano-British tradition continuing into the mid-5th century and overlapping with the arrival of the South Saxons.